Standout Toro Rosso driver (which isn’t hard to do alongside Daniil Kvyat) Carlos Sainz Jr. will be loaned out to Renault for 2018, the team confirmed today. 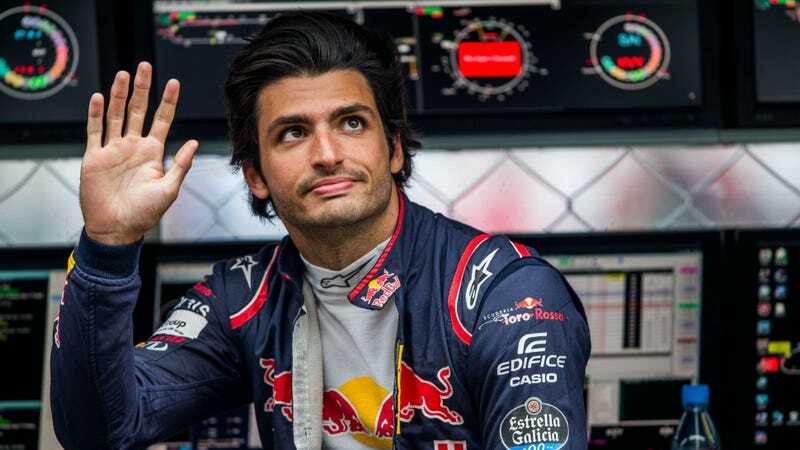 Sainz’s loan to Renault is widely believed to be the deal that let Toro Rosso end their power unit supply contract with Renault early, so naturally, it was announced at the same time as the big engine swap of 2018. It’s also probably a safe place for the genuinely talented driver to land, given that Honda still hasn’t made good on all their promises to get a competitive engine with McLaren after three years. Toro Rosso confirmed that it was taking on Honda power units in a multi-year deal today. Sainz has scored 100 points so far in F1 with Toro Rosso, with his best finish being sixth place. That’s not bad for what amounts to a same-series feeder squad for Red Bull’s non-translated-to-Italian A-team. Before that, Sainz was the 2014 Formula Renault 3.5 champion and the 2011 Formula Renault 2.0 NEC champion. Carlos Sainz is a very promising driver who has been on our radar for some time, especially after his successes in Renault junior formulae. It is positive news for us to be able to confirm Carlos for 2018. This choice is well aligned with our mid-term strategic plans. We feel that Nico and Carlos will complement each other on and off track and the combination should help us push forwards on the grid. I would like to thank Helmut Marko for loaning Carlos to us for this period. We must thank Jolyon for his ongoing hard work with the team and his efforts over the past two seasons. He is a dedicated driver and we wish him the best in the next steps of his career. Sorry Jolyon! Maybe you’d have stayed if you had scored more than one championship point in the past couple years.